Growing up in Washington, D.C., I loved recess. Four Square, Kickball and Capture the Flag were my favorite games. Back then, I had no idea how play would influence my life — or how much play during the school day matters for children’s social-emotional development and academic success. I founded Playworks, which partners with schools, districts and afterschool programs to integrate social-emotional learning and skills-building into games used during recess and throughout the school day, after an encounter in an elementary school principal’s office involving three boys who had gotten into trouble at recess. Disagreements and kids sitting on the sidelines had become the norm, and conflicts that arose on the playground often carried into the classroom, taking up precious teaching and learning time. I was convinced that there was a better way. Playtime is more than just fun and games. Through play, children build confidence and develop critical social-emotional skills, become leaders and better understand how they fit into and interact with the world around them. An American Academy of Pediatrics clinical review found a correlation between playing and building better social-emotional, cognitive, language and self-regulation skills needed for mental stability, safe relationships, enhanced learning and success in adulthood. ● Cultivating the joy of learning: Play sparks curiosity, which supports memory and learning. ● Build leadership skills: Recess is an opportunity for guided play, in which children choose what to play and lead games in a safe and healthy environment with adult support. This helps students discover their own abilities to engage with peers and resolve conflicts on their own. ● Building trust: Stable relationships with adults are a buffer against adversity. ● Makes up for lost time: The United Nations recognizes play as a right for children, but from 1981 to 1997, American kids spent 25 percent less time playing. More than 3.2 million students report feeling left out or bullied at school each year. At many schools, discipline issues and bullying make recess a chaotic time for staff and a sometimes fearful time for children. Many kids come to school without the skills, such as leadership, collaboration and conflict resolution, needed to make completely unstructured recess possible. This is where adults come into play. 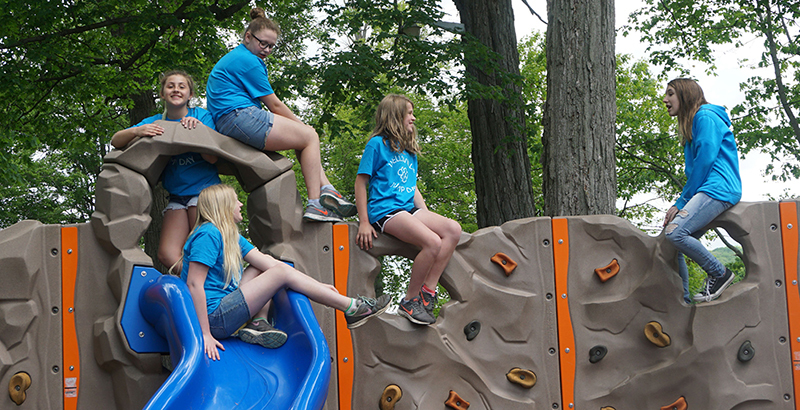 Having caring, consistent adults and, for older kids, peer leaders acting as positive role models helps make the playground a positive environment where every student is empowered and engaged. This ensures a baseline of safety for children to feel comfortable taking risks, discovering who they are, and playing with and learning from one another. If the playground is organized so several games are happening at once and the kids can jump into and out of any game they want to play, it will help students discover their own abilities and feel included so unstructured play is possible. We want kids high-fiving and cheering for each other and resolving minor conflicts on their own. When this kind of positive interaction moves from playground to hallway to classroom, school culture is positively affected — fights don’t carry over indoors, and students return to class more focused and ready to learn. A study by Penn State University and the Robert Wood Johnson Foundation found that for every $1 spent on social-emotional learning, there is an $11 return on investment. On every level, when students feel good in school, they are able to thrive, both academically and socially, and targeted learning interventions are most likely to succeed. Education investments in evidence-based social-emotional learning interventions, including play, have the power to transform schools. In order to make positive changes, we must put ourselves in kids’ shoes and identify with them. Play and recess can be an incredibly powerful tool to ensure our students feel safe in school and have fun while learning. Jill Vialet is the founder and CEO of Playworks, a national nonprofit leveraging the power of play to transform children’s social and emotional health. Jill Vialet is the founder and CEO of Playworks, a national nonprofit leveraging the power of play to transform children's social and emotional health.